The TSX-REC4 is a low cost high performance ARM Embedded Controller running Linux operating system. It is a perfect fit for automation, test and measurement applications as it also includes twenty fully reconfigurable I/O ports. Each of the twenty I/O ports can be configured by the user as either an analog input, analog output, digital input, digital output channels or even as an analog switch. This level of reconfiguration allows the controller to adapt completely to the application requirements. The TSX-REC4 Embedded Controller will put an end to the old need to buy more channels of a given type than the application requires due to the rigidity of plugin I/O modules and their fixed number of channels. If the application requires twelve analog input channels, 3 analog output channels and five digital lines for example, the twenty ports of this Embedded Controller can behave exactly like that. No extra modules to buy and no overpaying for embedded processing power or unused channels. The TSX-REC4 has also a real time clock so time-stamped data acquisition and streaming can be performed. Furthermore, the TSX-REC4 Embeeded Controller can be fully programmed in LabVIEW (Laboratory Virtual Instrument Engineering Workbench) by National Instruments. LabVIEW is a graphical programming language that uses icons instead of lines of text to create full-featured test and measurement applications. LabVIEW 2014 or better code can be downloaded to run embedded in the TSX-REC4 Embedded Controller, dismissing the need for the usual PC/Laptop + data acquisition device. Connect a monitor to the HDMI output and watch the LabVIEW front panel graphical user interface run. Do you prefer other programming languages? No problem. The Embedded Controller includes APIs for Python and C++ as well so you can run your text based code embedded. Since the controller runs Linux, you are in full control of how to best utilize this complete embedded data acquisition and control platform. All of this for $299! The table below shows a summary of TSX-REC4 processing power. The Embedded Controller offers on-hardware averaging for the analog input channels. On-hardware averaging implements, on the hardware, one of the most commonly used data manipulation techniques; averaging, also know as low pass filtering, of the acquired data. Averaging is extremely important and an efficient noise reduction mechanism. This on-hardware operation grants the CPU more time to carry on other activities and to receive already noise reduced data from the ADC. A maximum sampling rate of 400KS/s can be achieved on the multiplexed AI channels. Streaming applications can run up to 100KHz. One can set the ADC sample rate to values higher than 100KS/s, up to the maximum 400KS/s, along with the appropriate on-hardware averaging to bring the streaming rate down to 100KHz. Analog Output channels can generate waveforms at 25KS/s. Any of the twenty ports can also be configured as software timed digital lines or even as an analog switch. Furthermore, the Embedded Controller includes a real time clock for time stamped data streaming applications. Table below shows a summary of the GPIO available as part of the TSX-REC4 Embedded Controller. The embedded controller ships with a web application served by the controller itself where the user can configure the controller IO personality as well as performed live analog or digital input acquisition and/or analog or digital output generation. The application can be launched from the web browser of any computer connected to the Internet by typing http://IP Address/TSX-Config in the web browser, where IP Address is the ip address assigned to the embedded controller. No need for heavy installations on a host computer in order to configure your embedded controller. Figure below shows a snapshot of the TSX-Config web application. From within TSX-Config, the user can determine the functionality of each of the available IO ports. I.e. whether they will function as analog input, analog output, digital input, digital output or analog switch. 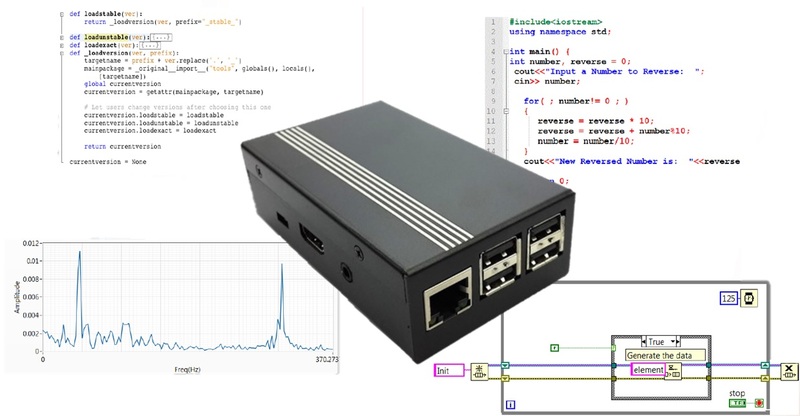 Once that is accomplished, the user can configure parameters that are specific to the ports functionality, such as ADC sampling rate, number of hardware averaging points, etc. The user also has the option to use live windows to visualize acquired data on a graph or to generate analog or digital output stimuli on the configured output channels. As previously mentioned, the REC4 embedded controller runs regular Linux operating system. Therefore, it doesn’t offer real time capabilities due to the non-preemptive nature of the operating system. However, if real time performance is required, we are developing another controller, the TSX-MULTIRT that allows LabVIEW RT to run embedded in the target.